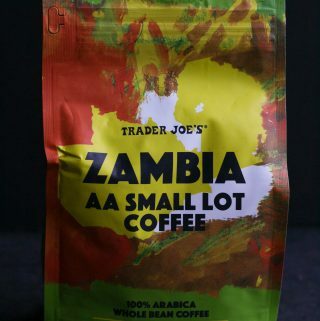 The pros: Trader Joe’s Zambia AA Small Lot Coffee are large beans and a memorable flavor. 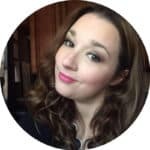 The cons: If you like coffee than doesn’t have much body, then you’ll want to pass on this one. 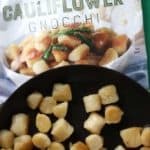 One my of readers, Scott, followed up about this product being called “small lot.” See his findings in the comments section. 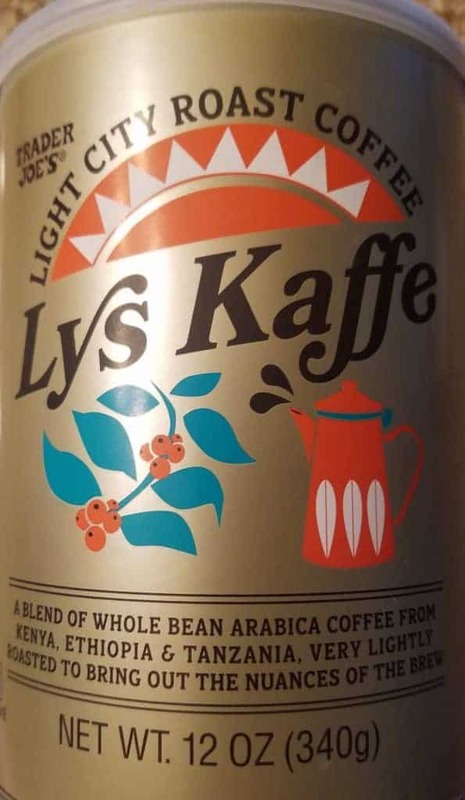 The pros: Trader Joe’s Lys Kaffe Coffee is a coffee meant to fill a gap in the coffee aisle. 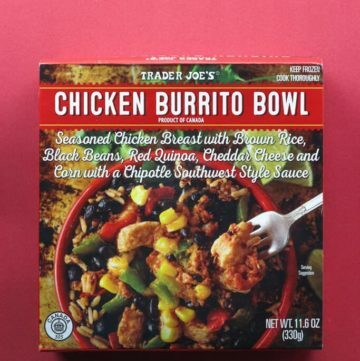 For the most part coffee focus in Trader Joe’s has revolved around medium to dark coffee drinkers. Here is a light coffee that is good. The cons: Might not be for everyone. When I ground this at home, this had some pieces that were almost the color of sawdust. 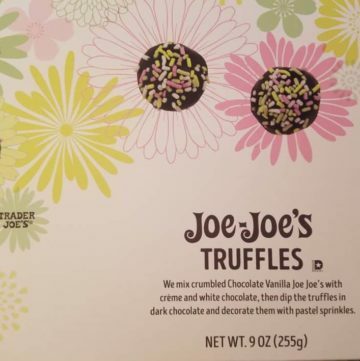 The pros: Trader Joe’s Joe Joe’s Truffles are found in the new items end cap. They are sweet, tasty and the middle is very light. 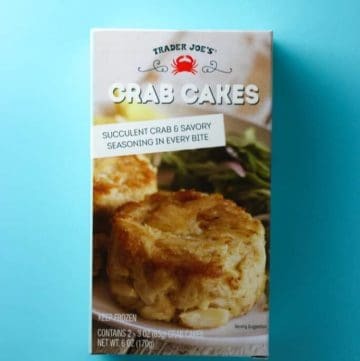 The cons: They added vitamins and minerals to the bottom of the nutritional label to make you feel better about consuming these. The sprinkles did not add much here. 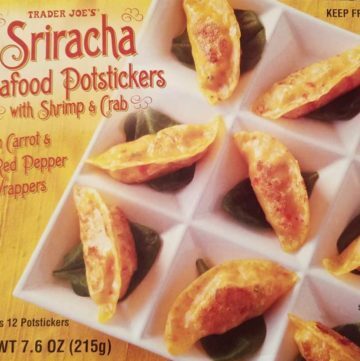 The pros: Trader Joe’s Matcha Green Tea is a nice balance of green tea and matcha flavors. 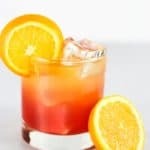 No calories and your entire day’s worth of vitamin C.
The cons: The can is a small size at just over 8 ounces. 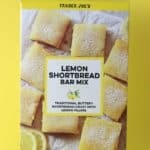 The pros: If you love Matcha, then Trader Joe’s Matcha White Chocolate Bar is probably for you. The cons: This is not going to be a universally well received flavor. In fact, there might have been some matcha overload as the flavor was present in both the white chocolate and the filling. My bar, while divided into 8 pieces never separated easily. 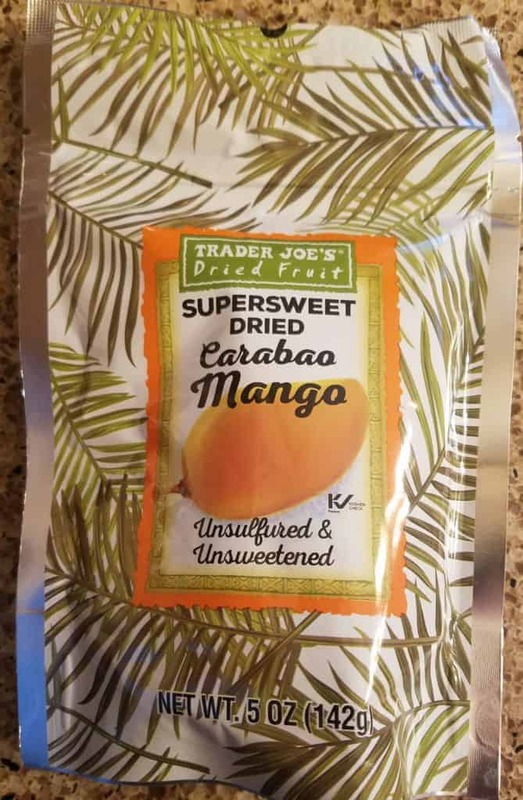 The pros: Trader Joe’s Unsweetened Golden Oolong Tea is prepackaged tea that has all of the vitamin C you’ll need in a day. 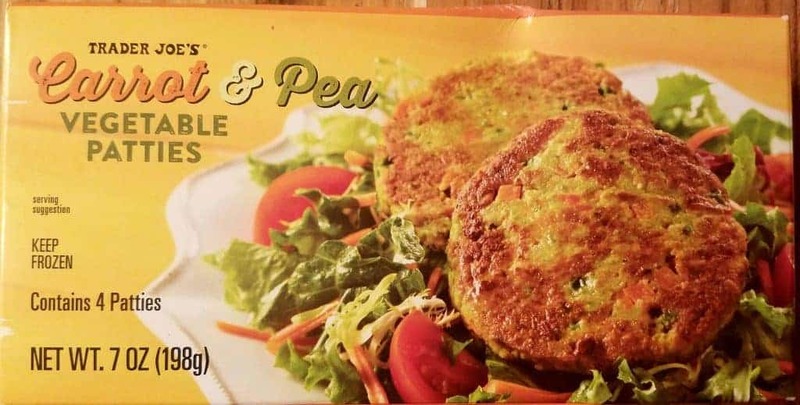 Best of all, this product has no calories. The cons: Flavor might not be for everyone and no mention of how much caffeine might be in this product. 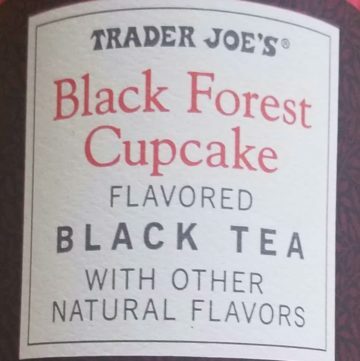 The pros: Overall, Trader Joe’s Black Forest Cupcake Black Tea is tasty tea. 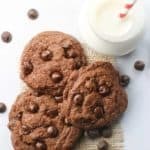 It is as chocolaty as can be expected when only adding water. It’s a sweeter tasting tea without any added sugar. Nice packaging and has well made tea bags. The cons: Doesn’t fully live up to its name “Black Forest.” While it is nice and chocolaty, there is no true cherry aspect and the other strongest note after chocolate was licorice. 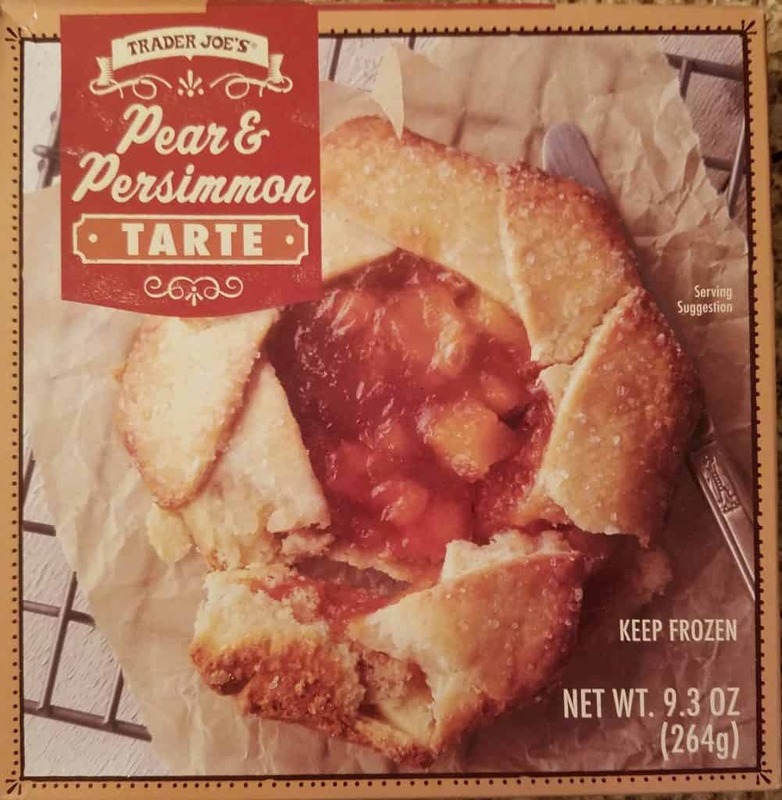 The pros: Trader Joe’s Organic Himalayan Honey is a tasty honey with a sugary top. 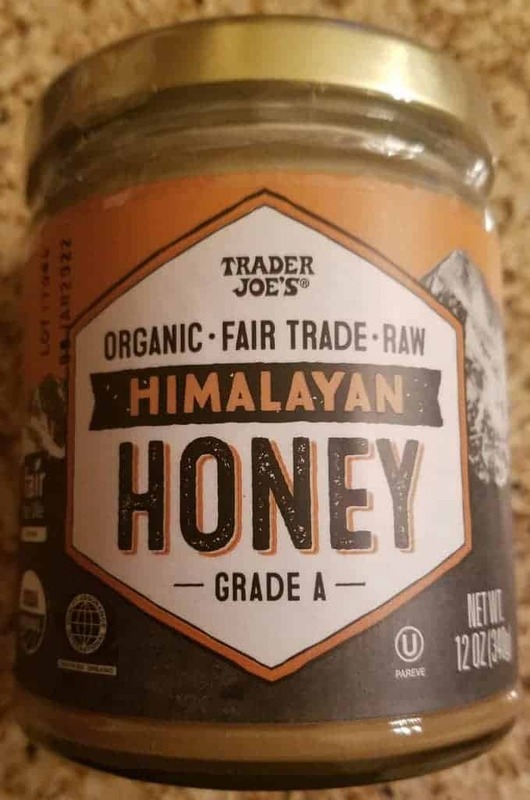 The cons: Trader Joe’s Organic Himalayan Honey is a thick honey that you’ll need a knife to spread, so if you are baking you still might need to reach for a more liquid honey. 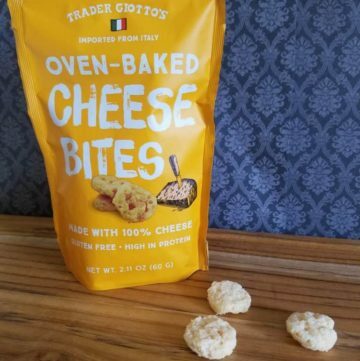 The pros: Trader Joe’s Oven Baked Cheese Bites are crisp, tasty, cheese crisps that go well with soup, salad or just to snack on. Gluten free if you are concerned about that. Half a days worth of calcium. The cons: Should come in a resealable bag to prevent you from eating the whole thing. 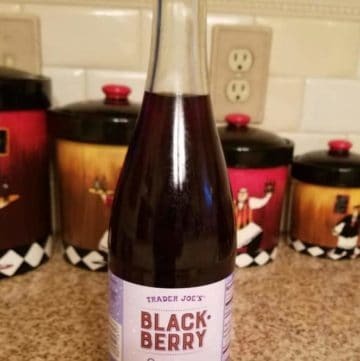 The pros: Trader Joe’s Blackberry Spritzer is more flavorful than seltzer, but don’t expect it to be the blackberry equivalent to grape soda. The cons: Non resealable top which mean you are going to lose carbonation if you wait a day or two to drink this. You’ll also require the assistance of a bottle opener. 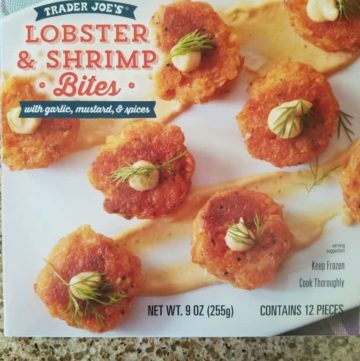 The pros: Trader Joe’s Lobster and Shrimp Bites are mini seafood patties, but not finger food. 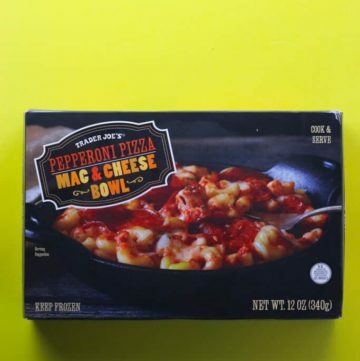 The cons: Follow the picture on the box if you want a sauce with this. It’s best to add a dab on top, as they won’t hold their shape for dipping. Strange almost carrot like orange hue to these. 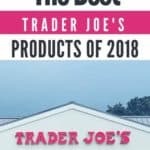 The pros: Trader Joe’s Buenalba with Sweet Paprika Cheese is a unique tasting cheese that is hard to place. 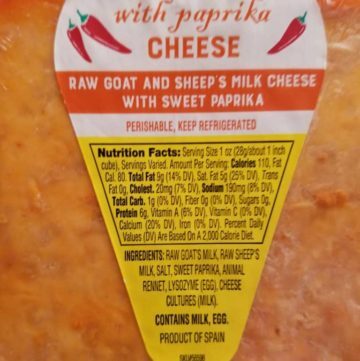 It says that its raw goat and sheep’s milk cheese. It truly ended up tasting like Bleu Cheese (If you are into that sort of thing). It’s not spicy at all. The cons: Trader Joe’s Buenalba cheese tasted like Blue Cheese and not the velvety smooth goat cheese taste I was looking for.